Ludicolo, The Carefree Pokémon. Ludicolo begins dancing as soon as it hears cheerful, festive music. This Pokémon is said to appear when it hears the singing of children on hiking outings. Upon hearing an upbeat and cheerful rhythm, the cells in Ludicolo's body become very energetic and active. Even in battle, this Pokémon will exhibit an amazing amount of power. With its unique type combination, Ludicolo should have a nice niche being able to sponge up hits and harrass threats with its support movepool. 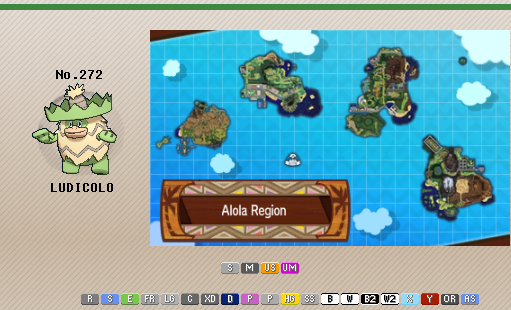 However, Ludicolo is hampered by its poor overall stats. In the lower tiers though, Ludicolo is still a beast, being one of the best users of Swift Swim and anti-Rain around. With its quad resistance to Water and resistance to Ground, Ludicolo can stop major threats to Rain and other Swift Swim users, such as Seismitoad, Lanturn, and Vaporeon, allowing it or other Swift Swim users like Omastar, Kabutops, and Qwilfish to sweep, or otherwise lend its pineapple hat to other offensive teams that need answers to these big threats. + Typing - Ludicolo has really nice typing, Water resisting a lot of Grass's weakness and vice versa. This leaves Ludicolo with a weakness to Poison, Flying, and Bug. 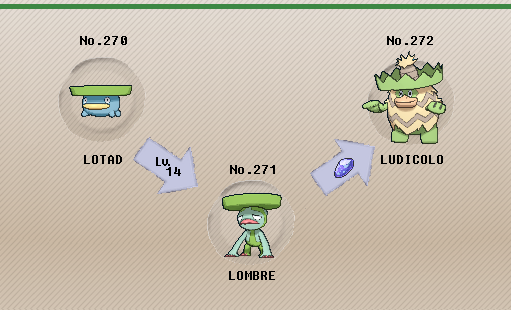 While these types are common in NU and RU, Ludicolo has nice resistances and Special Defense to boot, allowing it to check some major threats for Rain teams such as Seismitoad, Vaporeon, and Lanturn, as well as be able to switch into Steelix. + Movepool - Ludicolo has a strong movepool, bringing STAB moves such as Energy Ball, Giga Drain, Scald, and Hydro Pump to the table with coverage such as Ice Beam and Focus Blast. 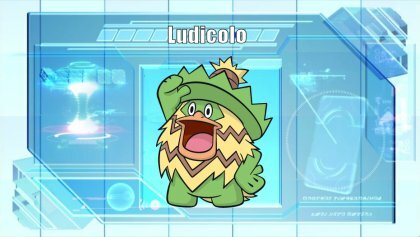 Ludicolo also has access to Swords Dance and moves to use of it such as Ice Punch, Thunder Punch, Fire Punch, Zen Headbutt, Dynamic Punch, and Knock Off. Finally Ludicolo has nice support options, namely Teeter Dance, but also has moves such as Leech Seed, Synthesis, Whirlpool, and Icy Wind. - Low Speed - With a base Speed of 70, Ludicolo can have a hard time, even with the boost from Swift Swim, as a single drop in Speed makes it vulnerable to being revenge killed. Outside Rain, Ludicolo's Speed means that it's outpaced by most notable offensive threats such as Scyther, Delphox, and Toxicroak. - Physical Defense - Ludicolo is really hampered by its low Physical Defense of 70, meaning priority is a major problem. Threats such as Hitmonlee and Absol can create trouble for it with their powerful priority moves. Bulky Physical threats such as Golbat are also a problem for Ludicolo as it can sponge a hit and retaliate for a lot of damage. Rain Dish - Heal 1/16th of the users maximum health in Rain - Nice defensively, although Swift Swim is better in Singles. Rain Dish has merit in Doubles acting as a tanky support with moves such as Leech Seed and Teeter Dance, but even then Swift Swim is much more consistent. Swift Swim - Doubles user's Speed in Rain - Overall the best ability in Singles, this allows Ludicolo to bypass its low Speed while Rain is active and apply pressure with its good offensive coverage. Own Tempo - Immune to Confusion - Overall the weakest ability Ludicolo has, but it is funny when used with Teeter Dance support to mess with players. Giga Drain is the prefered Grass STAB move, having slightly less power than Energy Ball but allowing Ludicolo to heal off any damage it takes from switching in or from Life Orb recoil. Hydro Pump is the best Water STAB to use with its immense power. Ice Beam is the primary form of coverage hitting Grass threats and Toxicroak that otherwise resist Ludicolo's STAB combination. The last option is open to Surf, more useful on a designated Rain team and allows a reliable Water STAB minus the raw damage, or Rain Dance to allow Ludicolo to sweep on its own. However, it needs two turns to get rolling (one to switch in, one to set up Rain Dance). Focus Blast can be used to prevent Ferroseed from being a major problem for Ludicolo as well. Z-Crystals - In theory, Ludicolo would love the Z-Crystals as they help make up for its low base Special Attack. However even with Z-Crystals, Ludicolo loses out on a lot of OHKOs it would need, or at least need the RNG to roll well. Hydro Vortex in the rain is a 62.5% chance to OHKO Golbat without Stealth Rock, while Subzero Slammer doesn't even guarantee a OHKO on Toxicroak with a layer of Spikes and Stealth Rock. Bloom Doom doesn't nail anything hard enough to really warrant considering. Energy Ball - Energy Ball brings more power, allowing Ludicolo to 2HKO Assault Vest Slowking, preventing it for switching out and healing by Regenerator or phasing with Dragon Tail. Energy Ball also OHKOs unboosted Slowbro and can OHKO defensive Qwilfish, preventing Thunder Wave and Spikes in the later case. Rain Dance Users - With Swift Swim being Ludicolo's best ability, a Rain Dance setter is the best partner hands down. Uxie is nice defensively, able to set up screens, Stealth Rock, or suicide lead with Memento. Mesprit is more rounded bringing more offensive pressure with moves like U-Turn and having more power with 105 base Attack and Special Attack. Finally, Liepard is the best general inducer with Prankster giving it priority when using Rain Dance. Golbat - With its Poison/Flying typing Golbat is able to answer a lot of dangerous threats such as Sceptile, Toxicroak, and Hitmonlee. This makes Golbat a strong partner with Ludicolo as it can stop some big threats to Ludicolo's sweep. Golbat also brings strong hazard control to the team with Defog and can stall-break with Taunt. Qwilfish/Kabutops - With its Poison typing, Swift Swim ability, and access to Swords Dance, Qwilfish makes a nice secondary Swift Swimmer for the team, pivoting well into Ludicolo's checks. While Toxicroak really hampers Ludicolo, it has a harder time dealing with Qwilfish, granted Qwilfish can't do a lot back. Qwilfish also brings Spikes if needed to lean more in the supporting aspect. Kabutops on the other side is more aggressive, boosting with Swords Dance and then muscling through threats with Stone Edge and strong Aqua Jets. Since Weather and Drizzle setters are viable options to run for VGC 2018 or Doubles format, Ludicolo is a contender for a team slot geared for rain. It becomes a speed demon under rain, though not unstoppable in this bulky meta. Fake Out is a stellar move for doubles, allowing to stall out one of the opponents out of a move while you set up your own. Alternatively, Protect eases prediction and increases survivability. If under rain, Hydro Pump becomes a monstrosity with unparalleled power. Giga Drain is mentioned as a healing option that deals decent damage despite being weaker than Energy Ball. If power is your preference, Energy Ball racks up more damage in the long term. Ice Beam rounds off coverage, dealing with several key figures that dominate doubles. Icy Wind is mentioned for speed control plus added damage, though it is inferior on Ludicolo who would rather be pumping out damage. Life Orb is the way to go, as with most Ludicolo sets. Waterium Z creates a surprise nuke out of Hydro Pump, but it is usually not worth it as its damage becomes lackluster overall. .
- Focus Blast can be considered as a coverage option, however it becomes a niche option as you are narrowing the amount of Pokémon that you can nail. 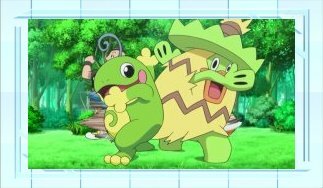 - Pelipper and Politoed are best friends for Ludicolo in any doubles format. Despite the team becoming rather mono-type, other powerful rain attackers aid Ludicolo in its mission to wear down opponents such as Kingdra or Mega Swampert. - Secondary weather setters via rain dance never hurts. - Allies that destroy other weather setters deserve honorable mentions, though rain has an advantage against most sun and sand setters naturally. - Pairing him up with someone that can Taunt is equally as important in order to prevent the opponent's Trick Room or Tailwind. Golbat - With its impressive defensive ability thanks to Eviolite, Golbat takes at most 50% health from Hydro Pump while pressuring back with Brave Bird. Golbat does need to be wary on switching in as Ludicolo will outpace it while Rain Dance is active and makes it a clean 2HKO, especially while Stealth Rock are in play. Toxicroak - With its ability Dry Skin to negate Ludicolo's boosted Water moves as well as a resistance to Ludicolo's Grass STABs, Toxicroak is a major problem to handle. Ice Beam is barely a 2HKO with Life Orb as well. Even with a Z Crystal, its a 50% chance of a OHKO after a layer of Spikes and Stealth Rock. Finally, Toxicroak can outpace Ludicolo when Rain Dance isn't in effect. Sticky Web - With Ludicolo's low base Speed, Sticky Web makes it so Pokemon with a base Speed of 105 outpace Ludicolo in the rain. This means that setting up Sticky Web allows most revenge killers to outpace Ludicolo, making it significantly easier to handle.